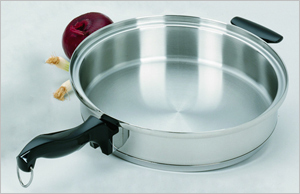 Revolutionary in design, this 12 1/2” skillet with domed cover is convenient for every meal, from baking to stir-frying. The liquid oil core spreads heat evenly over the entire cooking surface, including the sides. Completely immersible and dishwasher-safe (with heat control removed) the elegant design allows serving right from the utensil. Perfect for chicken and dumplings, ribs, roasts, stews, chili, soups, and cobblers. The liquid oil core spreads heat evenly over the entire cooking surface, including the sides. Also may be used as a "deep fryer". 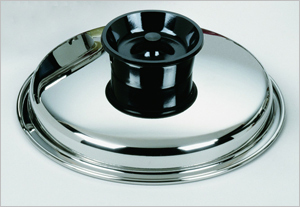 Whether used on a stovetop or oven, the platter-like design makes a unique serving platter while providing excellent heat conduction and easy clean up. 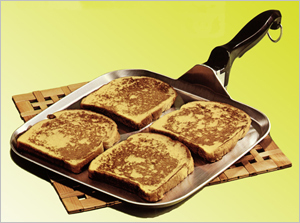 Perfect for pancakes, French toast, omelets, bacon, eggs, tortillas, crepes, steaks, burgers and much more. This is one of the handiest pans a cook can own. 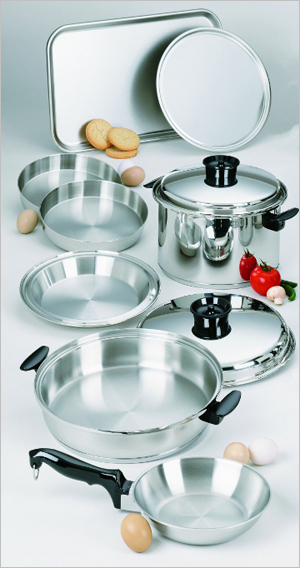 It is ideal for making soups, vegetables and sauces, also good for warming baby food and leftovers. 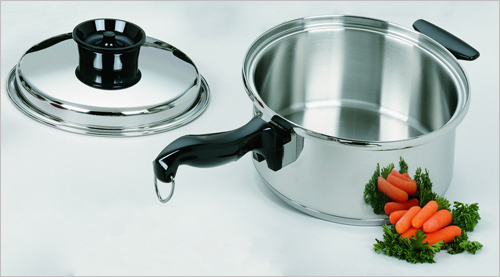 This all-purpose pan is perfect for family sized servings of vegetables, soups and cereal. 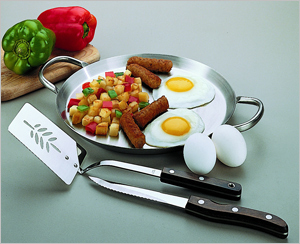 This small skillet is just the right size for preparing bacon or eggs, sautéing fresh vegetables or preparing frozen vegetables. 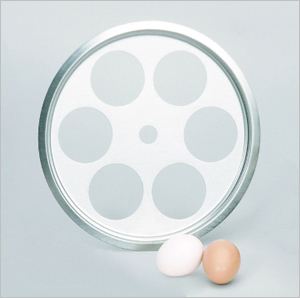 Use with the Dome Cover to create a junior roaster, fryer or range top oven. 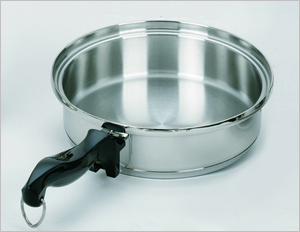 This skillet may be also used with the 3 Hole Utility Rack and Utility Cups for poaching. 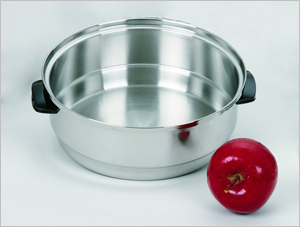 This generously sized pan is ideally suited for cooking fruit, vegetables and stews. 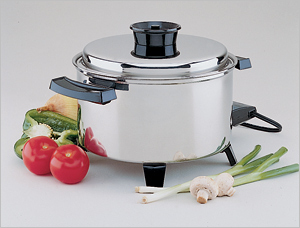 it gently “steam cooks” vegetables and fruits. 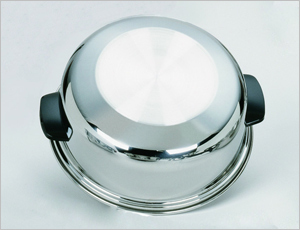 This versatile pan may also be used with the 9” Dome Cover. 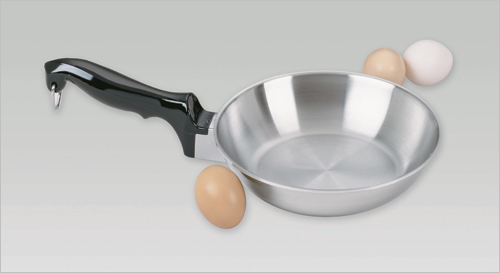 This generously sized skillet can be used to fry, broil, grill and sauté. French toast, bacon and eggs. Can also be used with 11” Dome Cover. 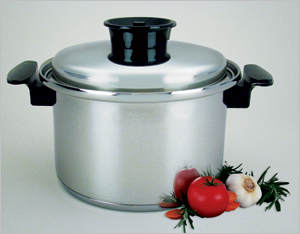 This “work horse” of the cookware set is superb for preparing large roasts, baked hams, and “ all in one pot” meals. 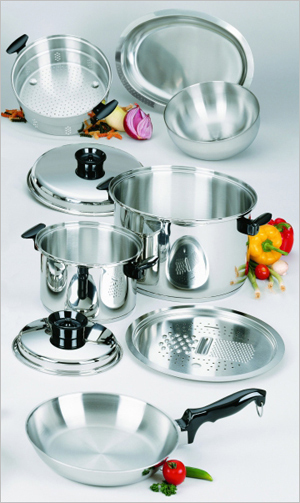 Fruits and vegetables can be cooked in quantity; it makes preserving and canning easy. 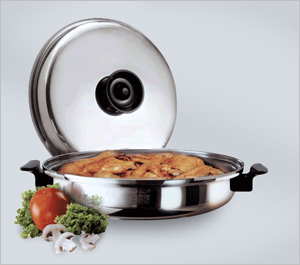 Additional Dutch Ovens are available in 4 Qt, 8 Qt, 12 Qt, 20 1/2 Qt sizes. High cover for the 3 Qt Saucepan and 9” Skillet. High cover for the 11” Skillet, 6 Qt Dutch Oven and 8 Qt Dutch Oven. 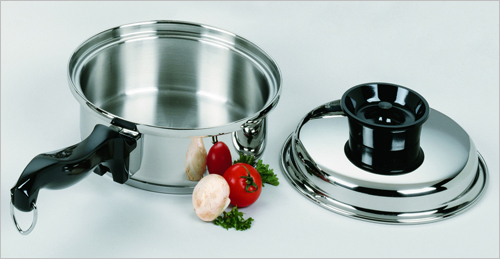 This multi-purpose pan is ideal to steam bulky foods – hot dogs, vegetables, and fruits. Rice potatoes, press vegetables or use as a colander for rinsing foods. 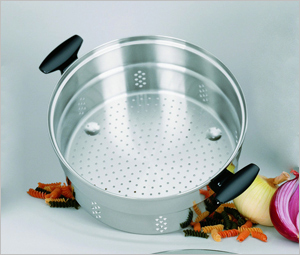 6 Qt Colander is also available. 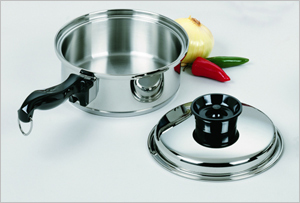 Combined with the 3 Qt Saucepan to make a double boiler. and make tasty individual desserts. Steam corn and other large vegetables or fruits. 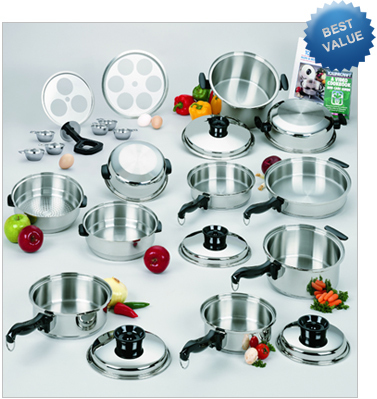 This rack fits the 3 Qt Saucepan, 9” Skillet and 4 Qt Dutch Oven for smaller food preparation. Mash potatoes, prepare applesauce and baby food with this easy to use utensil. 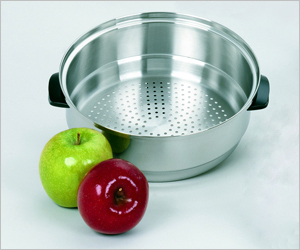 Simply put food in the steamer/ricer/colander then place over the 3 Qt Saucepan and press through. This generously sized 12 1/2” skillet is not only beautiful, but can perform almost any large cooking job. Ideal for two whole chickens, a 6 lb. roast, steak, ham steak, 8 hamburgers, pancakes, and eggs or delicious skillet dinners. 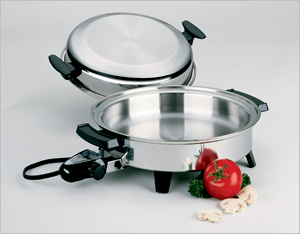 Same as the 10” Omelet Pan for smaller meal preparations. 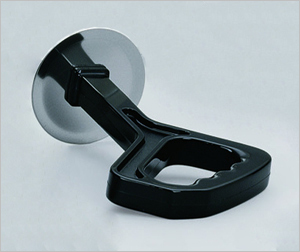 Great for making crepes and blintzes, preparing omelets, frying or scrambling eggs. You can sauté meats, mushrooms, and onions. Also good for frying sausage or bacon and reheating leftovers. Special aluminum core promotes rapid and even heat. Ideal for link sausage, pork patties, hot dogs, hamburgers, ham steak, fish, potato patties, steak and pork chops. Great for grilled sandwiches also. 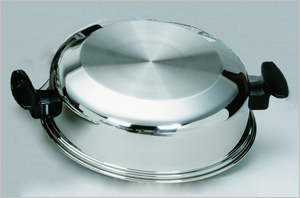 Whether used on a stovetop or oven the platter-like design makes a unique serving platter while providing excellent heat conduction and easy clean up. 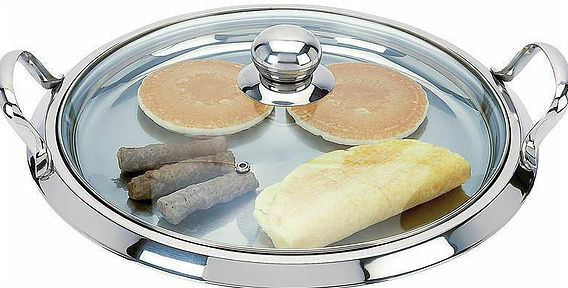 Perfect for pancakes, French toast, omelets, bacon and eggs, tortillas, crepes and much more. Strain or steam for use with the 6 Qt and 8 Qt Dutch Ovens. 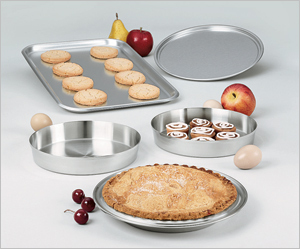 Easy to clean stainless steel, set includes two 9” round cake pans, 9” juice-saver pie pan, 12” pizza pan and 12 1/2” x 19” cookie sheet.